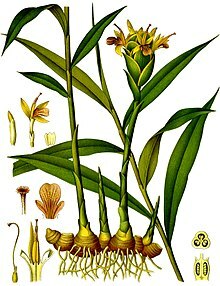 Ginge or ginge root is the rhizome o the plant Zingiber officinale, consumed as a delicacy, medicine, or spice. ↑ "Zingiber officinale information from NPGS/GRIN". ars-grin.gov. Retrieved 3 March 2008. This page wis last eeditit on 2 Februar 2017, at 15:53.